Born at Château of Arcs in eastern Provence, 1263; died, 17 January, 1329. 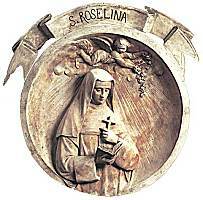 Having overcome her father's opposition Roseline became a Carthusian nun at Bertaud in the Alps of Dauphiné. Her "consecration" took place in 1288, and about 1330 she succeeded her aunt, Blessed Jeanne or Diane de Villeneuve, as Prioress of Celle-Robaud in the Diocese of Fréjus near her home. In 1320 her brother Hélion, Grand Master (1319-46) of the Knights of St. John, restored the monastery, and in 1323 and 1328 John XXII, formerly Bishop of Fréjus, increased its revenue, granting indulgences for the anniversary of the dedication of the church. Roseline obtained leave to resign her office before her death. Many visions together with extraordinary austerities and great power over demons are ascribed to her. Her feast is given in the Acta SS. on 11 June, the day of the first translation of her remains in 1334 by her brother Elzear, Bishop of Digne; but by the Carthusian Order it is celebrated in 16 October. There has always been a local cultus and this was confirmed for the Diocese of Fréjus by a Decree of 1851, for the Carthusian Order in 1857. The saint is usually represented with a reliquary containing two eyes, recalling the fact that her eyes were removed and preserved apart. This relic was still extant at Arcs in 1882. There is no ancient life of the saint, but that given in the Acta SS., 2 June, 489 sq., was constructed by Papebroch from ancient documents.